Apr. 4, 2014 5:00 a.m.
Warburg Seed Cleaning Co-op Celebrates 50 years of service to area farmers. Pictured here are the past and present directors who attended the celebration. Tom Luethi, Plant Manager is also shown in the photo. 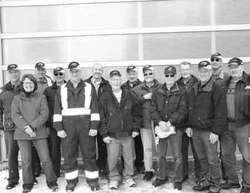 On Thursday, March 27, 2014, the Warburg Seed Cleaning Co-op celebrated its 50th Anniversary with a complimentary BBQ lunch held at the on site warehouse. Over 100 people attended, including product representatives from AGSI, BASF, Proven Seed and SeCan, and area government representatives. Well wishes were brought from Brazeau County by Councillor Anthony Heinrich, Leduc County Agricultural Services Foreman Aaron Van Beers and Warburg Deputy Mayor Fred Rapati. Plant Manager Tom Luethi spoke of the industrial partnerships that will allow the Co-op to bring in additional products at more competitive prices. Director Leslie Nemeth gave a review of the Co-op’s historical highlights spanning the past fifty years. Director Donna Tomaszeski is credited for doing the in-depth historical research and was at the heart of organizing the event. The first meeting of the Warburg Seed Cleaning Plant Co-op was held on January 27, 1964 at the John Hakstol residence with 14 members present. S. Brooks was elected president, with Bert Rimer as Secretary-Treasurer. Spencer Goddard from the Alberta Department of Agriculture and Leduc County District Agriculturalist Jim Gylander were also present. All agreed to pay $2.00 to cover minor expenses. Sam Ruff donated $5.00 to cover incorporation papers. A goal was set to raise $17,000 by selling $50 shares, while Leduc County and the Province of Alberta would kick in $51,000 to help cover the seed cleaning plant building and equipment expenses. After signing the corporate papers, the group agreed to meet in one week’s time. February 4: Of the 31 members present at the second meeting, 29 agreed to sell shares to neighboring farmers. By the February 10 meeting, 189 shares had been sold bringing in $9,450. A week later, the shares campaign saw 254 shares sold ($12,500). $15,850 was raised by the fifth meeting on February 24. A loan by an interested person (temporarily covering 25 shares to be sold at a future date) netted the Co-op an additional $1,250—bringing the total to $17,100. The bank balance as of March 3 totalled $17,700. The 2.25 acre plant site was purchased on March 7 from Tom Gee for $700. The building committee was chosen, including S. Brooks, Sam Ruff, and Charlie Lindahl. Gilbert Connolly was hired on May 16 as the plant manager (to begin on September 1, 1964). In July, the members learned that the cost of the plant now would be in excess of $53,500, so more shares were sold to meet the unanticipated increase. Seed cleaning rates were set at 4 cents/bushel; 6 cents for non-shareholders on September 29, 1964. Apparently, the completion date of the plant was not recorded; however, the official Opening and the first Annual Meeting were held in the Warburg Legion hall on November 16, 1964. The manager’s report of January-February 1965 stated 19,211 bushels were cleaned and a second man was hired to help. In August, 1965, cleaning rates per bushel were increased accordingly: Fall—5 cents, Winter—6 cents, and Spring—7 cents. By comparison, current rates (for 2014) are: Fall—56 cents, Winter—59 cents, and Spring—62 cents per bushel. The land north of the plant was sold to Co-op Petroleum (now UFA) for $700. The plant was cleaning oats, wheat and barley and selling forage seeds and herbicides. A little over a year later, in September 1966, Ben Grohn was hired as plant manager when Gilbert Connolly moved on to the Rimbey Seed Plant. 1969: First Brillion Grass Seeder purchased. 1974: Cambra Foods of Lethbridge set up four, round, 19 foot bins as a canola gathering centre. 1977: Jack Penner was hired as temporary manager when Ben Grohn resigned to move to Wetaskiwin. 1999: Jack Penner resigned his position of 22 years as plant manager. In all, Penner had put in 33 years of service. Tom Luethi became the next plant manager. 2000: Purchased the lot north of the UFA for $750 to be used for setting up hopper bottom bins for grain storage. June 2006: Purchased the lot west of the UFA for $10,000 to be used as a ring road and the future site of the warehouse. Summer 2010: Over the years, various cleaning equipment had been repaired and replaced. In 2010, the original wind & screen machine was replaced for $66,000. “About the same time,” said Nemeth, “we purchased a new color sorter and the air compressor that comes with it for $90,000.” Brazeau and Leduc Counties both gave $70,000 grants; as well, the Plant Co-op received $21,000 from the Federal Growing Forward Fund. Fall 2011: The warehouse is built by Bernie Geiger. It serves as storage for herbicide and seed, and a space for shop repairs. February 2012: Warburg Seed Coop becomes a Power Rich Corporation Agent; shortly after, the Co-op partners with Andrukow Group Solutions to provide a greater selection and more competitive pricing of herbicides, seed treatments, canola seed, etc..
2012 was a record breaking year with over 607,300 bushels cleaned by the color sorter—mostly ergot removal in wheat. Normally, about half that amount us cleaned. 2013: Back to the average output with 331,511 bushels cleaned. Alfred Anderson, Tom Bevan, S. Brooks, Clyde Cunningham, Phil Eyre, John Hakstol, H. Hansen, Ernie Hatt, Lional Hyland, H. Impy, Bernard Johnson, Roy Kvarnberg, Charlie Lindahl, L. Mattl, Nowell Pickeral, Bert Rimer, Sam Ruff, Harold Stevenson, George Van Ember, Bert Flathers (County of Leduc Councillor), and Jim Gylander (County of Leduc District Agriculturalist). Cecil Andersen, Glen Belozer, George Cygan, Brad Drewniak, Dave Gitzel, Ed Hakstol, Willy Hatt, Anthony Heinrich, Ken Johnson, Lloyd Knopp, Stan Krawiec, Walter Krawiec, Dwayne Kruger, John Kugyelka, Mike Kurley, Max Lemermeyer, Steve Lorencz, Charlie Martin, Stan Matthews, Mike Meinczinger, Les Nemeth, Steve Nemeth, Lynn Oberle, Norman Ohrn, Steve Pichonsky, Dave Rogers, Dale Sheetz, Vern Siemans, Ted Slusarczyk, Donna Tomaszeski, Stan Tomaszeski, and Wes Tweedle.